Bring the Holidays to Life with Small Potatoes! | Let's Go Chipper! Bring the Holidays to Life with Small Potatoes! The Holiday season is upon us and it’s time to start the fun! More often than not, games and activities these days are played on a screen. Kids aged 8 to 18 spend, on average, 44.5 hours per week in front of a screen, according to the Department of Health. Whether they are watching their favorite show or writing… er, typing a school assignment, the amount of time kids (and adults too!) spend looking at a screen is flabbergasting! Apps and online games can be educating, fun, and beneficial in various ways but we cannot underestimate the importance of real-life experiences and play. Play is a remarkably creative process that fosters emotional health, imagination, original thinking, problem solving, critical thinking, and self-regulation. As children actively invent their own scenarios in play, they work their way through the challenges life presents and gain confidence and a sense of mastery. When they play with materials, children are building a foundation for understanding concepts and skills that form the basis for later academic learning. Combining the digital and durable worlds is something our Let’s Go Chipper!™ programs have been encouraging for years and now our friends at Magic Toy Maker are bringing in some cute spuds from the App world righto your doorstep. Little Airplane’s Small Potatoes, a popular kid’s show in the UK starring adorable, singing spuds, has come to life in a new app, Small Potatoes Magic Toy Maker. Dress up and personalize your Small Potato with an array of Holiday outfits on the app then get it delivered right to your doorstep for under $20! Shipping is free until November 11th so don’t miss out on the fun! 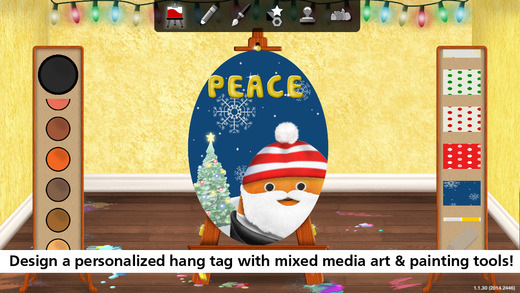 Plus, you can design your very own gift tag with a variety of fun backgrounds and stamps to personalize a present. There are hundreds if not thousands of new apps to choose from out there but the Small Potatoes Magic Toy Maker is different because it integrates online play with a physical good! Nothing is more magical during the Holiday Season than bringing imagination to life in the form of a soft and cuddly plush toy designed with love. Download it today for free on iTunes or Google Play and join the conversation on the Magic Toy Maker Facebook page! Entry filed under: Connecting Family, Early Child Education, Good Kids Apps, Kids Games. Tags: Digital to Durable, Fun Kids Apps, Holiday App, Holiday Gifts for Kids, Magic Toy Maker, Small Potatoes, Small Potatoes Magic Toy Maker, Small Potatoes Magic Toy Maker App.